Q: I'm in search for a product like "Deluxe Menu". 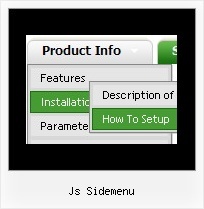 Before buying your software, I'd need to know if I can use images (eg *.jpgs) within rollover drop menu instead of just text; my menu items need to be images. Does "Deluxe Menu" support this? A: Yes, you can create image-based rollover drop menu. Q: I built the menu and tried it in my site and I see nothing but text. No Block arrangement as in the preview within the builder. A: Please, send us a copy of your html page (including .js files) ora direct link to your website, so we can check it. Probably that you have overlooked to add dmenu.js file or images onyour server. Edit href= Edit. Return to top. Does anybody have the skills to pull out the CSS and JS used in the Monaco nav sidebar?